Hardwood decking is the natural material for extending living space into the outdoors. North American decking species such as redwood, cedar, and pressure treated southern yellow pine are soft. Tropical hardwoods like ipe, massaranduba, cumaru, and red tauari are much harder and do not require frequent maintenance with waterproof coatings. Tropical hardwood decking does not require toxic chemicals to resist decay. We offer four tropical hardwoods species, ipe decking, massaranduba decking, cumaru decking, and red tauari decking. We sell 1st grade, all heartwood decking. Standard sizes are 1x4, 1x6, 5/4x4, and 5/4x6. All four species are beautiful, rot resistant natural products that will last more than 25 years outdoors. Your choice will depend upon color and cost preferences. Plaza Hardwood tropical hardwood decking is the most beautiful, long term investment a homeowner can make in gracious outdoor living. Ipe decking is dark brown with reddish or greenish overtones and muted grain patterns. Ipe is naturally water repellant and very rot resistant and very hard. If left unfinished, it will weather to a light gray color during the course of a few seasons. Rain and sun remove the surface color. In dry climates like the southwest, ipe will fade to a milk chocolate color and turn gray slowly. Dried and acclimatized ipe decking will surface check very slightly in service. Massaranduba decking is deep red brown with barely noticeable grain patterns. It is slightly harder than ipe decking and will weather to a light gray in wet climates. Massaranduba is naturally water repellant and very rot resistant. In dry climates, it will fade to a lighter brown red. Massaranduba decking is slightly less expensive than ipe. Properly kiln dried massaranduba decking will surface check slightly in service. Air-dried massaranduba decking that has not been dried to less than 15% moisture content and acclimated to local humidity conditions will end and surface check noticeably. Red Tauari is reddish tan with delicate grain patterns like mahogany. It is softer than ipe decking, but much harder than redwood or cedar. It will weather to gray in wet climates and to a light tan in dry climates. It is easier than ipe to work with hand tools. Red tauari decking is less expensive than ipe and upper grades of redwood and cedar, and much more beautiful than southern yellow pine. 1st grade red tauari decking includes some natural dark charcoal-like streaks. Properly kiln dried red tauari decking will surface check very slightly in service. Cumaru decking is golden brown with strong visible grain like oak. It is slightly softer than ipe decking and will weather to a light gray in wet climates. In dry climates, it will fade to a lighter golden tan. Cumaru decking is slightly less expensive than ipe. Cumaru is naturally water repellant and very rot resistant. Properly kiln dried cumaru decking will surface check slightly in service. Handling: All Plaza hardwood decking is imported with spacers between layers and is stored indoors until ready for shipment. Care should be taken to store it properly out of direct sun prior to installation. Acclimatizing to the local climate for a week or so is always a good idea. If a shaded area is not available, then the units of decking can be covered with cardboard, plywood, or a tarp that does not extend down the sides of the units. Installation: Several methods of installation are appropriate for tropical hardwood decking. Face nailing is not one of them. Stainless steel screws are the best option for attaching decking to the framing. Pre-drilling is required for all hardwood decking. Various “clip” systems utilizing a groove in the edge of the decking boards are available. They all work well provided manufacturers instructions are followed and the decking boards are dried and acclimated to the installation locale. Fasteners that are not stainless steel may discolor the wood over time. Decking installed without adequate ventilation of the underside of the deck will tend to cup over time due to unequal moisture conditions. Adequate drainage and ventilation are required for long-term success. 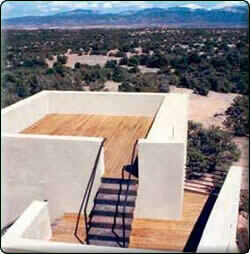 The narrow 4 inch width of decking performs better in difficult locations. Endcoating: Although not strictly necessary with properly dried decking, endcoating the freshly cut ends of the decking will improve the long term performance of the decking. Products like Anchor SealTM are the best, but a readily available exterior oil finish will work well. Finishing: None of the Plaza Hardwood tropical hardwood decking species require finish to protect them from the elements, insects, or mold. All of them look very beautiful like fine furniture /when finished with outdoor, UV resistant decking finishes formulated for hardwood decking. We do not recommend thick coats of finish. It is better to rub in thin coats. Any new deck will benefit from one thin coat of finish in the first months of its life outdoors. Inevitably decks are installed before the decking has had a chance to completely acclimate to local conditions. The slight surface checking typical of all hardwood decking can be reduced to near zero with a coat of finish, which can be left to weather off after a year or two. We recommend power-washing with plain water soon after installation and prior to finishing if a finish is used. We always available for detailed discussions of the particular conditions unique to your project. tonifuge@plzfloor.com 800-662-6306.